Osweiler has been named the Dolphins' starting quarterback for Sunday's game against the Jets, Adam Schefter of ESPN reports. Osweiler is expected to receive another start Sunday against the Jets with Ryan Tannehill (shoulder) having yet to resume throwing a football as of Wednesday, Adam H. Beasley of the Miami Herald reports. 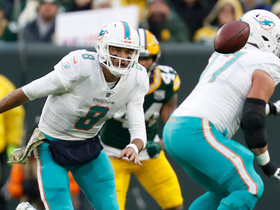 Analysis: The Dolphins have yet to confirm the assignment, but it looks very much like Osweiler will earn his fourth consecutive start in Week 9. Osweiler took a step back in the Dolphins' 42-23 loss to the Texans in Week 8, but he'll have a good opportunity to rebound Sunday against a Jets squad that has dropped two straight games and is allowing an average of 259.8 passing yards per contest. Osweiler completed 21 of 37 passes for 241 yards and an interception during Miami's 42-23 loss to the Texans on Thursday. Osweiler will start Thursday's game in Houston, Cameron Wolfe of ESPN.com reports. Analysis: Ryan Tannehill (shoulder) has been ruled out for at least one more game while recovering from an AC joint sprain. Osweiler has done nice work as a fill-in starter, but he'll now face a major challenge against a red-hot Houston defense with both Kenny Stills (groin) and Albert Wilson (hip) unavailable. Osweiler completed 22 of 31 passes for 239 yards and two touchdowns during Sunday's 32-21 loss to the Lions. He added a two-yard run during the contest. Osweiler will start Sunday's game against the Lions, Cameron Wolfe of ESPN.com reports. Osweiler completed 28 of 44 passes for 380 yards, three touchdowns, two interceptions and a two-point conversion while rushing for eight yards on two carries in Sunday's 31-28 overtime win over Chicago. 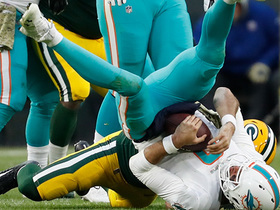 With Ryan Tannehill (shoulder) inactive for Sunday's Week 6 tilt against the Bears, Osweiler will be the Dolphins' starting quarterback, Cameron Wolfe of ESPN.com reports. Analysis: Osweiler will have the benefit of a fully stocked receiver corps with the return of DeVante Parker (quadriceps), but his spot start will come against an aggressive Bears defense that's allowed the second-fewest passing yards (922) in the league while also snagging the third-most interceptions (eight). Osweiler has only seen action in one game this season, completing four of five passes for 35 yards and a touchdown in mop-up duty against the Patriots in Week 4. Osweiler completed four of five passes for 35 yards and one touchdown during the Dolphins' 38-7 loss to the Patriots on Sunday. He also rushed once for seven yards. 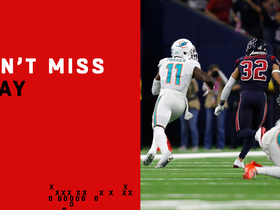 Analysis: Starting quarterback Ryan Tannehill looked lost throughout the Week 4 tilt, managing only five yards per attempt and consistently turning the ball over. 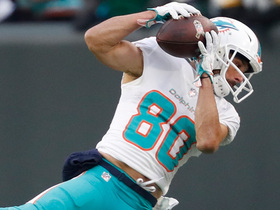 Tannehill was benched once the game was completely out of reach, and Osweiler led Miami on a meaningless scoring drive, slinging a six-yard pass to Frank Gore. Osweiler's performance should firmly secure him the backup job, but expect Tannehill to retake the reins and attempt to bounce back against the Bengals in Week 5. 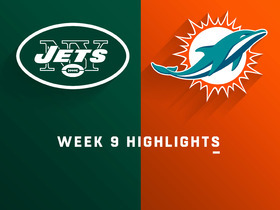 Osweiler will back up Ryan Tannehill during Sunday's game against the Titans, Cameron Wolfe of ESPN.com reports. 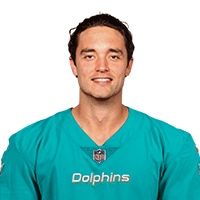 Analysis: Osweiler beat out David Fales to work as a backup to Tannehill, who is returning form a torn ACL and making his first appearance since 2016. Osweiler suited up for six games in Denver last season, completing 56 percent of his passes for 1,088 yards, five touchdowns and five interceptions. 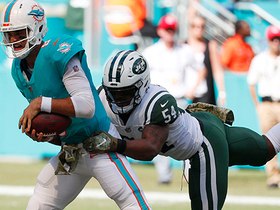 Head coach Adam Gase recently indicated that the competition for the No. 2 quarterback job between Osweiler and David Fales is "day-to-day," Adam H. Beasley of the Miami Herald reports. Analysis: Neither Osweiler or Fales did much to separate himself this summer, and so the battle for the backup job rages on. Regardless of who wins out, it's hard to envision either as an attractive fantasy asset should something happen to Ryan Tannehill. Dolphins head coach Adam Gase indicated Wednesday that Osweiler is working on a few mechanical adjustments, Joe Schad of The Palm Beach Post reports. Osweiler is signing with the Dolphins, Adam Schefter of ESPN reports. 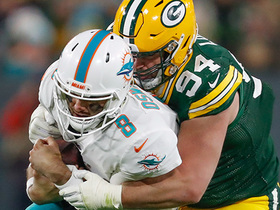 Analysis: The Dolphins seem to be moving on from Matt Moore, as they re-signed David Fales last week and now are adding another veteran. Osweiler had as many turnovers as touchdowns both of the past two seasons, bouncing from Houston to Cleveland to Denver after receiving a contract with $37 million guaranteed from the Texans in March of 2016. The 27-year-old figures to compete with Fales for the No. 2 job behind Ryan Tannehill, who's still rehabbing from August surgery to repair a partially torn ACL. Osweiler is slated to visit the Dolphins on Thursday, Adam Schefter of ESPN reports. Analysis: This marks Osweiler's first free-agent visit since his 2017 contract with the Broncos expired. It's worth noting that Osweiler and Miami head coach Adam Gase worked together while both were with Denver, so there's a potential fit here, with the Dolphins' No. 2 QB slot behind Ryan Tannehill (who is bouncing back from a torn ACL) up for grabs. Osweiler completed 96 of 172 passes for 1,088 yards, five touchdowns, and five interceptions during the 2017 season. He added 64 yards and a touchdown on 14 carries. Osweiler will serve as the Broncos' backup quarterback Week 17 against the Chiefs with head coach Vance Joseph announcing Tuesday that Paxton Lynch (ankle) would take over as the starter, Zac Stevens of BSNDenver.com reports. Osweiler is expected to return to a backup role Week 17 against the Chiefs with Broncos head coach Vance Joseph indicating that Paxton Lynch (ankle) will likely start the contest, Aric DiLalla of the Broncos' official site reports. "Our goal is to see [Lynch] play, so absolutely," Joseph said following Sunday's 27-11 loss to the Redskins. "If he's ready to go next week, he will probably play for us." Osweiler completed 22 of 38 passes for 193 yards and an interception during Sunday's 27-11 loss to Washington. 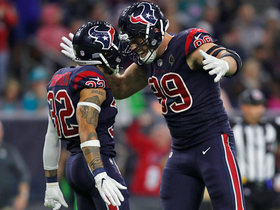 He added a two-point conversion, 27 rushing yards and a fumble during the contest. Osweiler will start at quarterback Sunday against the Redskins, Nicki Jhabvala of The Denver Post reports. Osweiler will start at quarterback Sunday against the Redskins, a Broncos teammate informed Mike Klis of 9 News Denver reports. Though the Broncos haven't announced a starting signal-caller for Sunday's game against Washington, "all signs point to" Osweiler getting the assignment, the Denver Post reports. Though the Broncos have not confirmed their Week 16 starter at QB, Mike Klis of 9 News Denver suggests that the "signs point to" Osweiler drawing the assignment. Analysis: Per the report, fellow signal-caller Paxton Lynch (ankle) isn't quite 100 percent at this stage, so it appears likely that he'll give way to Osweiler on Sunday against Washington, with Lynch a candidate to start next weekend against the Chiefs. Osweiler and Paxton Lynch (ankle) split reps at Wednesday's practice, Jeff Legwold of ESPN.com reports. Broncos head coach Vance Joseph wouldn't commit to Osweiler as the team's starting quarterback for the final two games of the season, Zac Stevens of BSNDenver.com reports. Osweiler completed 12 of 17 passes for 194 yards with two touchdowns and no interceptions in Thursday's 25-13 win over the Colts. He also rushed three times for 17 yards and another score and completed a two-point conversion pass. Osweiler will serve as the Broncos' No. 3 quarterback for Sunday's game against the Raiders, Mike Klis of 9 News Denver reports. Confirming an earlier report, Osweiler will be benched for Sunday's game against the Raiders with the Broncos set to officially name Paxton Lynch as their new starting quarterback Wednesday, Nicki Jhabvala of The Denver Post reports. The Broncos plan to announce Paxton Lynch as their Week 12 starter Wednesday, with Osweiler expected to settle back into a backup role as a result, sources have informed Dan Graziano of ESPN.com. Osweiler completed 23 of 42 pass attempts for 254 yards, one touchdown and one interception during Sunday's 20-17 loss to the Bengals. He also gained 24 yards on four carries. Osweiler (right shoulder) practiced fully Thursday. Analysis: ESPN's Jeff Legwold relays that Osweiler threw well at Thursday's practice and is in line to start Sunday's game against the Bengals. While the Broncos' top signal-caller for Week 11 is already known, coach Vance Joseph has yet to decide whether Paxton Lynch or Trevor Siemian will be Osweiler's backup Sunday. Osweiler was limited at Wednesday's practice by a right shoulder issue, Nicki Jhabvala of The Denver Post reports. 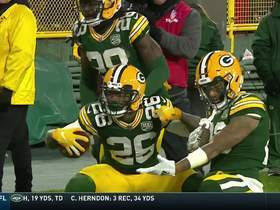 Analysis: Previous reports suggested that the quarterback was dealing with a minor chest injury, but his limitations Wednesday were instead related to an issue with his throwing shoulder. Osweiler is nonetheless still expected to make his third consecutive start Sunday against the Bengals, according to Jhabvala. Osweiler is dealing with a minor chest issue, Mike Klis of 9 News Denver reports. Analysis: Per Jeff Legwold of ESPN.com, the Broncos "dialed back" Osweiler's activity at Wednesday's practice as a result of the issue. Klis relays that the Broncos are still expected to proceed with Osweiler as their quarterback for Sunday's game against the Bengals, though that could change if the injury inhibits him in practices Thursday and Friday. Osweiler will start Sunday's game against the Bengals, Nicki Jhabvala of The Denver Post reports. Analysis: While not exactly impressive, Osweiler at least looked competent in Sunday's 41-16 loss the Patriots, completing 18 of 33 passes for 221 yards with one touchdown and one interception. The Broncos likely will give Paxton Lynch another look before the end of the season, but they aren't ready to go there just yet. Osweiler completed 18 of 33 passes for 221 yards, one touchdown, and one interception during Sunday's 41-16 loss to the Patriots. Osweiler will start Sunday's contest against the Patriots, Mike Klis of 9 News Denver reports. Osweiler completed 19 of 38 passes for 208 yards, a touchdown and two interceptions in Sunday's 51-23 loss in Philadelphia. Broncos head coach Vance Joseph informed the team Wednesday that Osweiler would start at quarterback Sunday against the Eagles, Mike Klis of 9 News Denver reports.